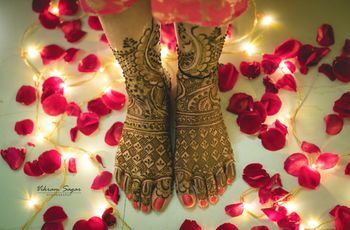 The Only Indian Wedding Dresses for Bride's Sister You Need to See Before Your Sibling's Big Day | Wedding Tips ARE YOU A VENDOR? Ever imagined your big sister tying the knot? Wasn’t it your lifelong dream to look like a vision when the day arrived? Keeping in mind the current trends, this will be your ideal guide for finding Indian wedding dresses for Bride's Sister. We love sisters who are unafraid to experiment with their outfits and give us some major fashion goals to turn some heads around. Sisters before misters! A sister is your treasure trove, one who has stood by you through all highs and lows. What’s better than being a bride? To be the sister of the bride. Amp up your fashion with these effortlessly stylish looks which are winning the hearts of bridesmaids everywhere. Take a look at these scintillating Indian wedding dresses for bride's sister and look like a showstopper at your sibling's big day and let all eyes be on you as you make way to the wedding venue. 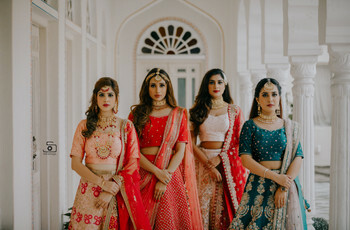 This article will narrow down for you Indian wedding dresses for bride's sister that are trending this wedding season. 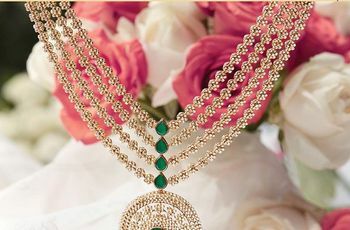 If your sibling is taking her vows this season, these designs are the ones for you to bring out the fashionista in you. While all eyes will be on your big sister, don’t forget to dress right and flash that infectious smile of yours. This is a function-wise guide for Indian wedding dresses for bride's sister, that will add bespoke and timeless beauty to your ceremony. A little inspiration from across the border. A Sharara not only accentuates your body but also adds a Sufiyana Andaaz to your overall look. You can go for a golden shade Sharara and wear it with a short Kurti. A sheer outfit with embellishments to add that necessary bling. A gold outfit is a must! Period. You will look like a dauntless beauty in this golden hue ensemble. 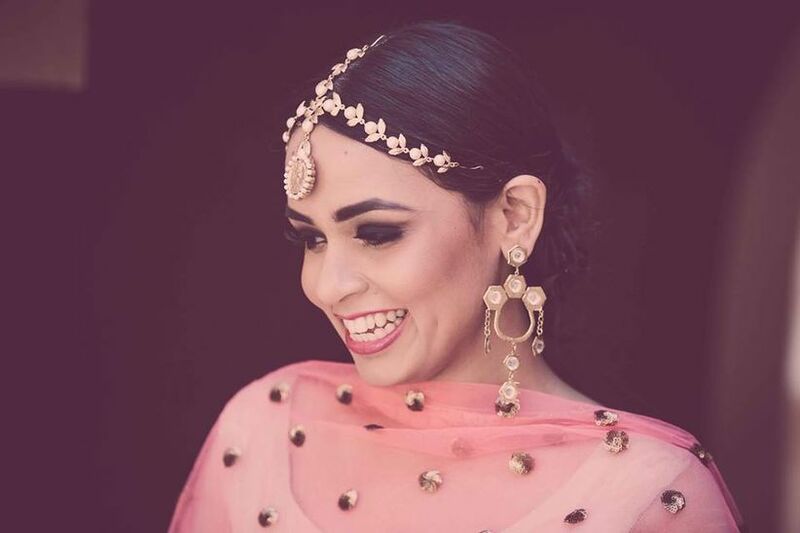 A sharara will make you look like a dream, a dandy pair of heels and throw in some studded danglers - and you will look like a killing machine! Accessorise your look with some statement jewellery pieces. Let your hair fall sideways, wear an ornate Jhumar with intricate stonework with heavy statement earrings. Add some bling to your wrists by adorning bracelets and a watch. Make your look even more stunning by adding some pop of colours through your makeup. Anushka Sharma’s character Alizeh in ‘Ae Dil Hai Mushkil’ left us stunned by her bold Indo-western outfit style inspiration. Why wait for your own wedding to make a style statement? This outfit choice is both trendy, daring and will easily bring out the oomph factor no matter what you pair it up with. Shirt blouses are the next big thing. You can flaunt your curves in this silhouette and pair it with contemporary state-of-art jewellery pieces. What makes this a trending choice? The fact that you can wear it with a long skirt or under a leather jacket in the future as well. You can easily pop out with this look with a light makeup, shades to nurture your boss self to bring out the swag with a side braid and some flowers for that added touch. Let your fashion be effortlessly trendy and chic. 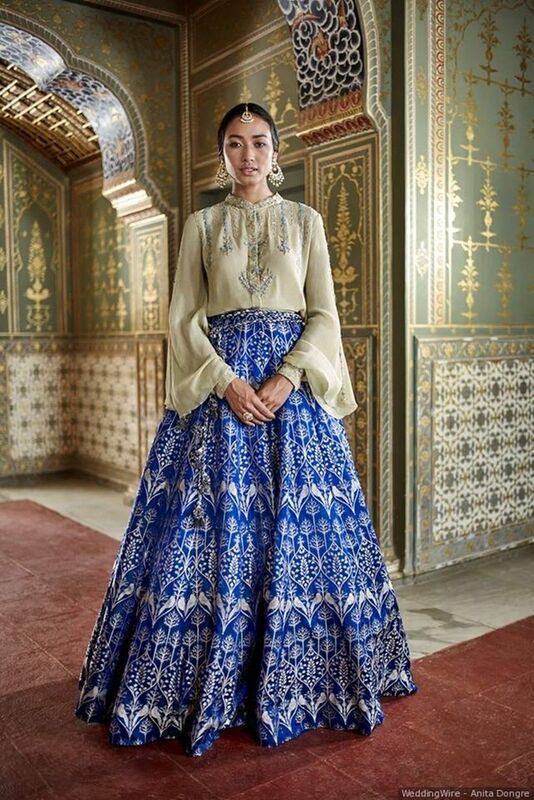 This long skirt is the only Indian wedding dresses for bride's sister that you need to get your hands on and slay! We don’t know about you, but a high-low skirt is the quintessential outfit choice for the sister of the bride. Go for a metallic shade and accessorise your look with some diamond danglers. Ditch the dupatta with this look and let your blouse be the high-point of your outfit. A gorgeous sheer blouse with mesmerising sequin and embellished detailing will accentuate your curves and reveal your skin in all the right places. You can experiment your way through by mixing and matching the colour tones of your skirt with your crop top. This is a new head-turner style inspiration that is serving looks for the sister of the brides this wedding season. This outfit has a lot of room for easy improv. From off-shoulder to sheer capes from your waist down, the range is magnanimous. Not only are these capes an excellent choice for weddings but can be worn later by pairing them up with a pencil skirt or tailored pants. 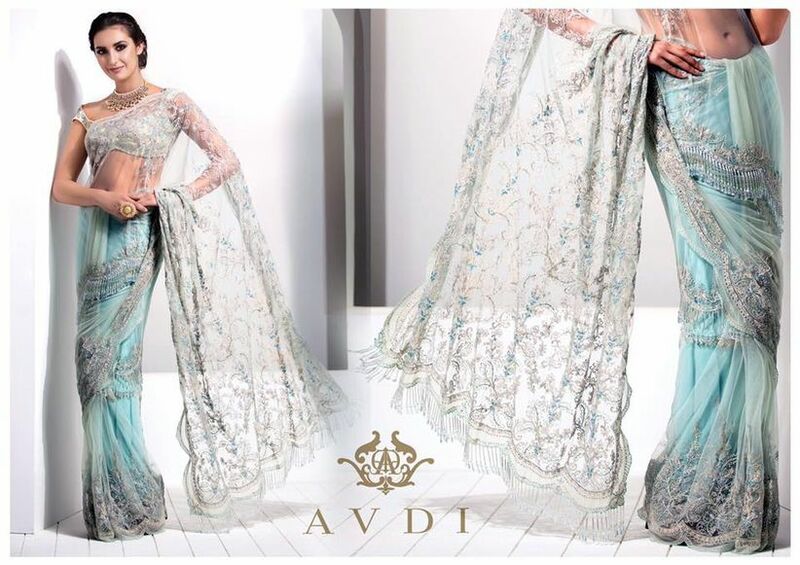 Pre-stitched saree is one of the most trending outfits when it comes to Indian wedding dresses for bride's sister. Sarees are known to be one of the most sensual and beautiful outfits in the world. This silhouette brings out the best of the Indian women by accentuating their inherent beauty, bodice, and adding grace. You can go for a traditional one or a contemporary saree and drape it in a plethora of ways. The traditional draping, or drape it using a Kamarband on your waist, with a flowing Pallu or a neatly pleated one. You can style it however you please and look like a damsel to impress. This year has been devoted to upbeat experimental looks. Ruffled lehenga is one such trend which picked up the pace in the year and is likely to stay put for seasons to come. 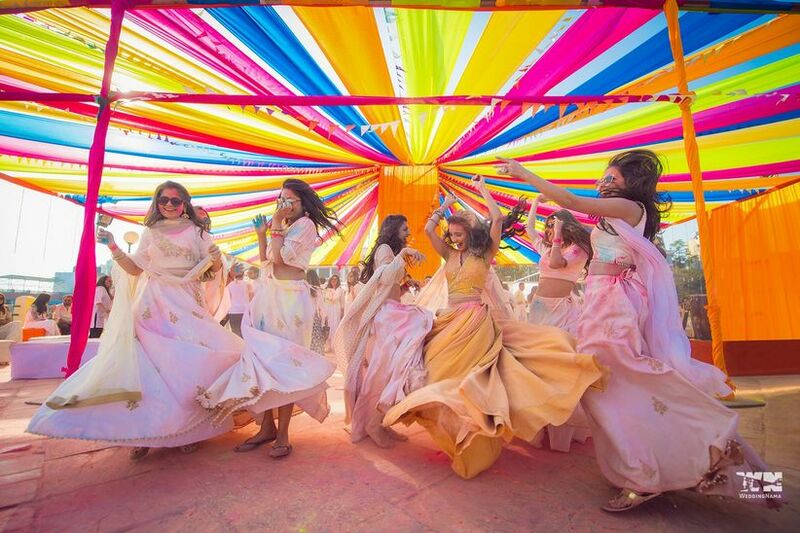 We’ve seen women slay ruffle sleeves but how about that beautiful and enormous lehenga? Ruffled lehenga is a memento of sheer perfection in terms of technique and design. These lehengas will make you feel no less than a princess and make you stand out in the crowd. You can amp your look by ditching traditional blouse pieces and choosing head turning crop tops to pair with them. The beauty of this garment is in its draping technique. It will make for a perfect twirling shot as you sway around in this beautiful garment, reflecting the dauntless fashion icon sister of the bride to be. 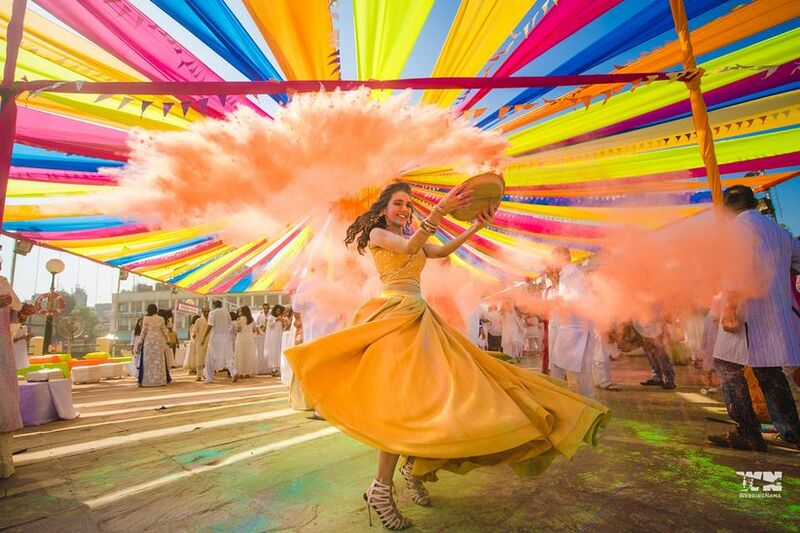 Indian wedding dresses for bride's sister is a sea of endless possibilities. 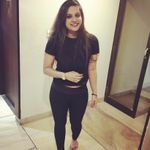 One will not have to think twice before investing in any of these above garments as they are trendy, chic and can be worn in the future as well. These will serve as inspiration for all your onlookers no matter how you choose to style them. Being the sister of the bride give yourself ample time to look for the perfect one and mix match it to come up with a unique look which is worthy of attention. Accessories these looks with your own pop, break the rules if you must. Now that you have seen these stunning Indian wedding dresses for bride's sister, which one will you pick for your sibling's big day? Make us a part of your style journey and tell us in the comment section how you rocked one of these Indian wedding dresses for bride's sister.